A retired government official in a northern Indian village is building a scaled-down replica of the historic Taj Mahal in memory of his wife of 58 years. 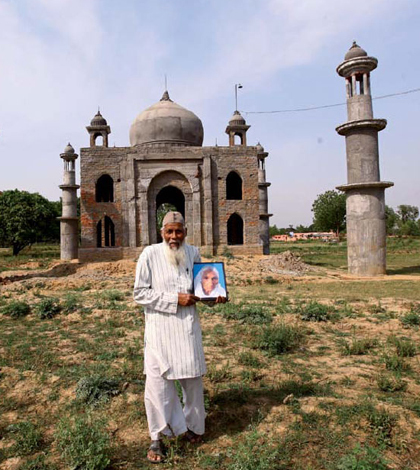 Faizul Hasan Quadri, 77, is building his “monument of love” for Tajammuli Begum in his nondescript village in Bulandshahr district in Uttar Pradesh state. Separated in time by nearly four centuries, the men behind the world famous original Taj Mahal at Agra and the replica share one thing in common: an extraordinary love for the women in their lives and an all-consuming passion to make their love immortal. And just like the Mughal Emperor Shahjahan’s white-marble monument attracts thousands of visitors, a steady stream of curious visitors from nearby villages is coming to see Mr Quadri’s Taj take shape. “You see, my wife and I were childless, so she always used to say, ‘after we are dead, there will be nobody to remember us, we will be forgotten’. So I promised her that if she were to die before me, I would build such a beautiful mausoleum for her that people would remember her for ages,” Mr Quadri says. Tajammuli Begum died of cancer in December 2011. “She was only 14 when we got married, I was about three years older… She was a very soft-spoken, simple, sweet-natured person, and everyone just loved her. When we got married, she was illiterate. Later, I taught her the Urdu language, but she could never write. “We were together for more than 58 years, and love grows with time. Now that she is gone, she is always there in my thoughts,” he says. The perfectly-shaped dome and minarets of Mr Quadri’s Taj are already in place, but a lot of work still remains. The latticed windows, landscaped gardens and white-marble exterior are yet to be done, but despite running out of money, he has refused offers of help. “This is not the mausoleum of a saint or a place of worship, this is just my wife’s tomb, and I don’t want to build her memorial using donations from others. I want to finish it using my own money, no matter how long it takes,” he explains. Mr Quadri has sold a piece of his farmland, his wife’s jewellery and used up his life’s savings to meet the spiralling cost of construction. He has already spent more than $15,000 (£9,872) and says he needs at least $10,000 (£6,581) more. “I have tried to keep my promise, and I won’t give up, no matter what it takes,” he says. Just as in the original Taj Mahal, Mr Quadri has left space for his own grave next to his wife’s and prays that “we should be together in the afterlife as well”.